Pet Emergency? Call us right away at (951) 656-4455! Dr. on Call Emergency services available. 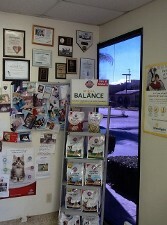 At Alessandro Animal hospital we share the love of your pets. We know how precious your pets are to you and your family. Dr. Randhawa and his fully trained staff are committed to giving your pets and you the best medical care, client education and customer service. We value the trust you have in us to care for your pet from birth to its golden years. Our Veterinary team is professional and will care for and treat your pet like a member of our family. We provide personal attention to the unique concerns of each individual pet owner. Our services and facilities are designed to assist in routine preventative care, early detection and treatment of disease as your pet ages. We will offer complete medical and surgical care as necessary during their lifetime. Keeping your pet healthy is easy when you turn to Alessandro Animal Hospital in Moreno Valley, California, for pet surgery and dental care. Improve your pet’s health and quality of life with the help of our friendly and caring staff, featuring 35 years of experience in the industry. At Alessadro Animal Hospital, we treat your pets like the valued family members they are.